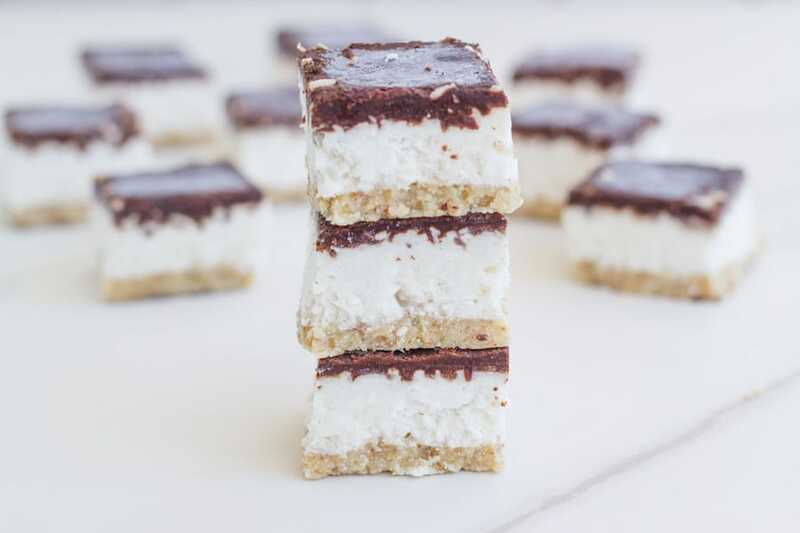 This raw bounty slice is super healthy and is gluten, dairy and refined sugar free. It is one seriously epic dessert. How yummy does my Raw Bounty Slice look? This is one epic tasting raw dessert! The coconut filling which is from my raw bounty bites recipe, was the basis for making this dessert. It is so tasty! I decided to make this raw bounty slice with a date-free base as I have had a few requests for less dates in my recipes. So you can use this base with some of my other raw slices, raw peppermint slice, raw chocolate raspberry slice and even my raw caramel slice bites (you may need to half the recipe though). Make sure that you allow it to freeze for 3-4 hours before you slice it, so that the coconut layer is completely frozen, otherwise the chocolate layer may split when you slice it. However, the slice can be hard to slice when it is completely frozen, so I suggest running the knife under hot water. That should help you to slice it. My raw bounty slice is AMAZING and so worth the extra time to let it set! Raw Bounty Slice. This deliciously healthy slice is gluten, dairy and refined sugar free. It is one seriously epic dessert. To make the base, process the cashews, almond meal, coconut oil, maple syrup in a blender or food processor until they resemble crumbs. Spoon mixture into a lined square baking tin (20x20cm) and smooth with the back of a spoon. Place in the freezer while you make the coconut layer. To make the coconut layer, add the melted coconut oil and coconut milk to a medium size bowl and whisk to combine well (you want to make sure that there is no separation between the oil and milk). Next, add the maple syrup, vanilla extract and sea salt and mix well. Then, add the shredded coconut and mix until well combined. Pour over the base, smooth with the back of a spoon and place back into the freezer while you make the chocolate layer. To make the chocolate layer, melt the coconut oil in saucepan on low heat. Once melted, remove from heat and add the maple syrup, whisking briskly until well combined. Then add the cacao powder, stirring until well mixed through. Pour the chocolate on top of the coconut layer and make sure it is evenly spread. Place back into the freezer and let it set completely. You want to ensure that all layers are frozen, so it may take 3-4 hours. You may need to run the knife under hot water to make it easier to slice. 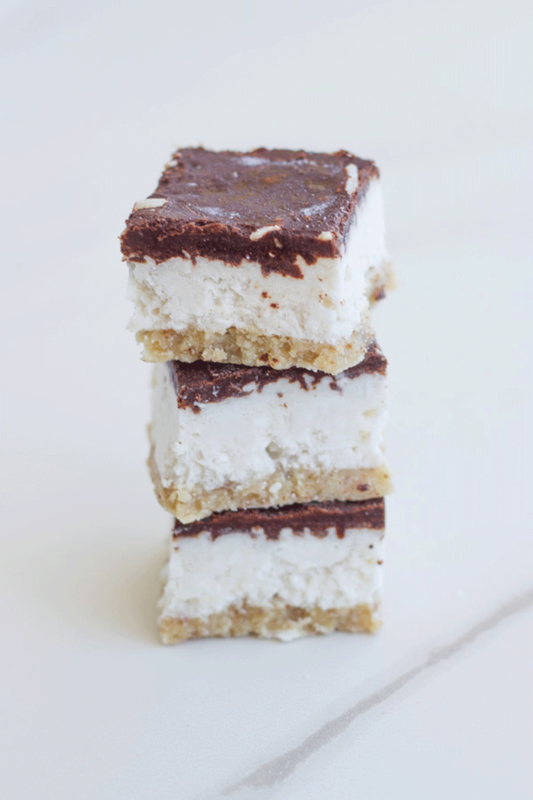 Cook time does not include the time it takes for the raw bounty slice to freeze — approximately 3-4 hours, depending on the temperature of your freezer. This looks like such a decadent dessert! Love that it’s gluten-free and refined sugar-free too! Three layers of deliciousness! These look so good! I love that they don’t have refined sugar in them. I’m going to give this recipe a try. Never heard of it! Totally want it! This looks delicious!! Oh, you only have to say bounty and I’m all over this recipe. I love that chocolate. Coconut and chocolate sure is an awesome combination. I can’t wait to try this. Saving for later. This sounds SO good! I love bounty candy bars, but I have to eat dairy-free, so these are the perfect healthier bounty replacement! Do you think these would work with almonds instead of cashews? Coconut and chocolate never fails. Anything with coconut , i cant wait to dig in. Bounty slice looks too good! These bars look so yummy! I love the chocolate and coconut combo! My mouth is watering just looking at it. The ingredients are all favorites of mine and in combination it truly would make a decadent dessert. I’m pinning and looking forward to making it!! Oh my goodness how decadent does this sound and look!!! And such clean ingredients! I can’t wait to make these!! My husband would love these, as well! It is very yummy! I have made it for many people and they all love it!